You have to admit that childbirth and impeccable organization skills are kinds of a package deal. They just happen to pop in over hand in hand. Talking about organizing, I’m sure you must have a hard time finding the stuff you need out of a crammed up bag when you and your baby are on the go. Been there. That’s when a smart stroller organizing accessory comes in the picture. It not only helps you put all your baby essentials such as water bottles, snacks in place but also ensures that your car keys, wallet are always easily accessible. I know it can be daunting to find the right stroller organizer for your precise needs. That’s why I did the hard part and put together everything you need to know to make an informed decision. Below I’ve listed down and reviewed the best stroller organizers I deemed worth your money and time. 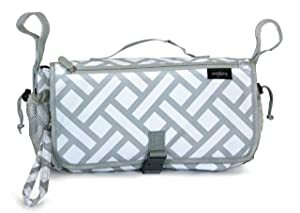 If you want to keep all your accessories in an organized manner while you are out for a stroll with your baby then Ethan & Emma organizer is here for you. You can use the organizer with your joggers, double umbrella strollers and standard day to day strollers. The organizer has two very deep drink holders that can easily hold your coffee cup and water bottle. There is also a center pocket in the middle of the drink holders that has a magnetic closure to keep the flap down which is really great while your baby is sleeping. No noisy velcro! It has a little zipper pocket (large enough to fit an iPhone 7 Plus and wallet) on the front that you can take off so if you have to leave your stroller you can bring your personal items with you. There is also a skinny mesh pocket that hangs down from the rear of the organizer. You can use the pocket to keep all your large items like diapers, wipes, toys and the pocket also can be rolled up when not in use. The organizer made of durable material. Materials are very easy to clean. The organizer handle loops are adjustable to accommodate different-sized stroller handles. The hanging mesh bag has straps so you can secure it at the bottom. You can easily fold your stroller without removing the organizer. I don’t have any complaint with this organizer. If you want to have a durable and secure organizer for your stroller then you are looking at the right product. The lock will keep all your entire baby item in a secure place plus it has a lot of compartment to organize your things while you out on the town. 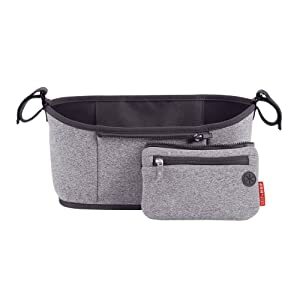 This organizer comes with 2 drink holders and a middle compartment that is useful to keeps your diaper, wipes, snacks and more. It also has a fold-over flap and when the flap is opened, there is a zipper pocket that is hidden from the public eye due to it facing the stroller back, perfect for keeping your wallet, tablet, credit card and other secure items. There are also have two side pockets one on the lift and one on the right that you can use to keeps your keys, pacifier, and other small items. I like the front compartment that zips off and can be carried separately. The cooler portion of this organizer is useful for carrying milk, cheeses, and yogurt. The velcro straps are adjustable and convenient for attaching any stroller handles. Zip on the clutch is sticky. Want an organizer for your side-by-side double strollers? then BTR Double Stroller Organizer is for you. This organizer has everything that you need when out within a finger reach. It has cup holders on both sides that are built-in elastic straps which will keep your water bottles from toppling out. The middle compartment is also very large that can hold baby’s diapers, wipes, snacks and all necessary items. It’s also got a few secrets zipper parts that can be useful to keep your keys, money, cards etc. The thing that I most like about this organizer is the exclusive phone flip pocket with a touch-compatible clear window that gives you an opportunity to monitor your calls even if you are on a walk. It also comes with 2 mini stroller hooks which are a huge bonus for hooking kids diaper bag, purse, and even water bottles too. Comes with a convenient key clip so you will never need to rummage around for keys. Has a weather proof pouch to keep your device away from liquids or rain. You can easily turn this organizer into an instant go-bag when the stroller needs to be folded. Some users complain that the cup holders don’t fit the bottles well. 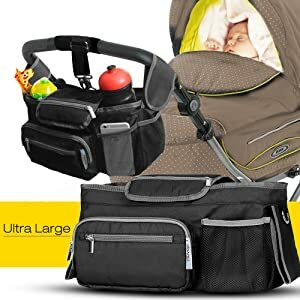 If you want an organizer that is pretty big and can fit almost your all items then stop searching and look at this Universal Baby Jogger Stroller Organizer Bag. This organizer has so many pockets that it can easily store all your necessary items without any problem. The front of the organizer contains 3 slim pockets that you can use for keeps your phone, wallet, and keys while the back side has a large mesh pocket that can be used for keeps baby diapers, toys, creams, and wipes. The inside has a divider for bottles and a zipper pocket. The center compartment is pretty large to carry your snacks, diaper pack, and other accessories. It also has a rubberized material close so you don’t have to worry about people stealing something if you turn your head. You can use the organizer as a shoulder bag with the extra strap. Comes with a silent velcro that won’t wake your sleeping baby when you opened the organizer. The front outer pockets are suitable for carrying small items. Can be attached to any stroller. And you also don’t have to remove it to fold the stroller. Some users complain about the silent velcro that it is hard to open and close. This is a great stroller organizer. I like the organizer because it is not too big and not too small in size. It has two cup holder, one on each side, that can be used to keeps your different sized bottles (baby bottles and adult water bottles) securely in place without any issue. The center part is great for holding phones, wallets, small diaper and toys. There is also a small zipper pocket compartment on the inside of the middle open pocket that is nice for keeps your key, cash or something small you want to be secured. It is made of durable material and waterproof design. The velcro straps are about 5 1/2 inches long so there’s enough to adjustment available to will fit a variety of equipment or strollers. Hidden zipper pocket in the middle section. This can hold something in case it rains. You don’t need to take the organizer off when folding up your stroller. The center compartment doesn’t come with a middle cover. Meet another universal baby stroller organizer that is made to fit most strollers handle and bars. The organizer comes with a little zipper bag that you can use as a wallet for money and cards since it can easily be zipped off and put safely in your pocket. 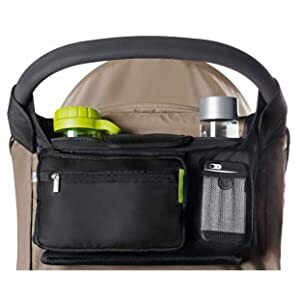 It has stiff dividers inside that create 2 drink holders on the left and right sides of the interior, leaving one large space in the middle section that you can use to keep your keys, a small book, snacks, toys, diaper, tissue, and wipes. You can leave the organizer in place, even when folding stroller. It’s easy to access and easy to use. Zipper compartment holds car keys, money/credit card securely. The center storage space is very roomy. The zip-off wallet is a nice idea but the zipper to unzip the pouch and the zipper that zips OFF the pouch are both on the same side. So, sometimes it happened accidentally, you zip the pouch OFF when your intention is to OPEN it. Want an organizer that will last very long time? then you can look BRITAX Stroller Organizer that made with 100% Polyester. This stroller organizer can be attached to almost any stroller and is adjustable to the stroller handle angle and width. It comes with two insulated beverage containers with internal frames that will keep your cold and hot drink bottle at the right temperature. There is also a middle compartment that could be used to hold your baby’s toys, small diaper, and wipes. I appreciate that the middle compartment will stay shut with a silent magnetic closure instead of Velcro. In addition, the organizer also has three outside pockets (hard to see in the picture unless you’re looking for them) that can be used for storing your small objects, like mobile wallet and keys. Has 3 pockets on the front that suitable for keeping small items. Has two insulated beverage holders for keeping warm drinks warm and cold drinks cold with the right temperature. The mesh pockets are pretty handy. You can not store your large items in this organizer. The pocket in the middle is also deep enough to hold essential items, like your passports, deck of cards, mints, wallet and any other small items. I like the velcro cover in the middle that comes with a small pouch to keep your mobile headphone or keys. It also has a large mesh pocket in the back wraps that is great for putting your baby’s diaper, food, toys etc and the pocket can be rolled up when you’re not using it. On the outside, It has two front pouches small one is for keys and phone and the large dual zip pocket for keeps your wipes, credit card, snacks and other things. In addition, It also comes with a carry strap that means you can take the organizer with you while you don’t need the stroller. The organizer is sturdy and well made and goes well with most of the strollers. It has tons of pockets to carry almost your all necessary items. Folds up well with the stroller as well for storing in a car, no need to remove. The mesh pouch on the front isn’t large enough to carry your tablet or bigger phone. Here is another great stroller organizer. The organizer comes with a carry strap, so you can use it as a shoulder bag also. It has insulated 2 drink holders that can easily hold your large water bottle and coffee cup securely in place. The center part is also great for holding diaper, wallets, wipes, toys and other accessories. In the front, it has small zipper pockets and a mesh pocket that will be perfect for keeps your all necessary things as mobile, wallet, battery etc. 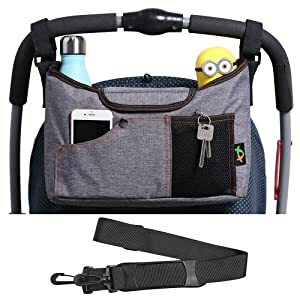 In addition, this stroller organizer also has a magnetic closure on the top with a zip pouch that you can use to keep your mobile headphone or keys. Its innovatively designed safety buckle makes it safe and secure. It has adjustable Velcro straps which securely fit most stroller bars and handles. It is made of very durable material. Comes with several storage pockets. JL Childress Cups ‘N Cargo Stroller Organizer is made of nylon material that provides outstanding durability. It features two expandable front pockets for carrying your bottles, cups or sodas in a secure position. The organizer comes with a zippered front pocket with reflective trim that is perfect for keeps your cell phone, keys, pacifiers and other small accessories. There are also two long zippered pockets that you can use to keeps your baby’s diaper, sunscreen cream, wipes and more important items. For more storage, It has an easy view mesh pocket that can fit your large items like clothes, raincoat, baby diaper, jackets, toys and more. And the mesh pocket also comes with a magnetic closure that keeps the mesh compartment closed and secured all the time. It folds well when the stroller folds. It has a tone of pockets for everything. The insulated center does a fair job keeping stuff cool for short trips. I wish the mesh back could roll up when someone didn’t want to use it. While buying any stroller organizer always consider the materials that used for making the bag. Mostly stroller organizer made of common materials includes nylon, denim, cotton, and polyester. These materials are must top in quality. However, In the market, you will find some cheap duplicate product, but don’t go for them. Maybe they’ll cheap but won’t last long. Organizers are mainly universal which means you can use them with absolutely any stroller you have. But there are some organizers which may not fit with your stroller. So, you should first check the compatibility of it with the stroller. It is another crucial factor to check that how many pockets the organizer has. Normally a great organizer comes with drink holders, zipper pocket, mesh pocket and a front pocket to carry all your necessary items. The stroller organizer must have flex technology, so that it stays in place. You might walk on uneven roads or even run with it, that requires the organizer to keep your stuffs in perfect place. With an adjustable strap, you can use your organizer bag on different surfaces including strollers, car back seat, and walkers. Your baby’s preference for outdoor or indoor will determine the features of a organizer. For indoor type baby, you need large-sized compartments that can hold heavy and big stuffs that they need at home. While for outdoor baby, you need more storage space to keep foods and water. Strollers are often manufactured from cheap plastic materials imported from China. While being cheap is not a problem, you must ensure that the material does not contain any banned or poisonous chemicals. This will eventually harm your babies if they come in contact with it. Actually, the price depends on the quality of the organizer bag. If you want something best you have to invest more money in it. Always try to go for a branded product it will ensure the organizer durability and performance as well. A stroller organizer will be a lifesaver for you while you stroll with your kid in their stroller. It has a lot of advantages feature-here are just a few of my favorites. No need for a bag: Stroller doesn’t have enough space to store all the stuff and necessary things for both the kids and mother. In that case, you may have to carry a bag to store your all items while you outing with the baby. But be practical, it is quite annoying to carry another bag on the hand while walking in the street or going to shop with the baby. That’s why a stroller organizer is mandatory! 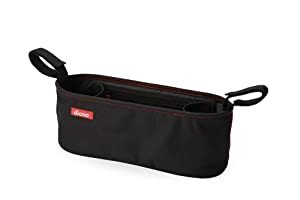 They are very small in size and also enough lightweight to attach any stroller handle where you can place all your essential accessories and you can also attach a stroller fan on the handle while you already attach the organizer. The add-on feature: If your stroller doesn’t come with the cup holders, then this feature will be a lifesaver for you and your baby. 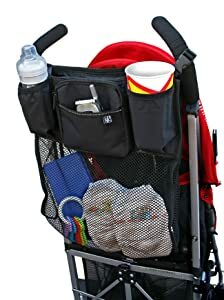 A stroller organizer comes with two specific spaces for parents to keep their water bottles or traveling coffee cup. Easy transport: When you travel with a stroller, the organizer helps in keeping important stuffs at hand like passport, ticket. So, you don’t have to open your bags again and again to look for it. Pocket for everything: Beside the cup holder feature, stroller bag has lots of pockets around it and inside it. That mom can use to store cell phones, toys, diapers, keys and other stuff to reduce the chances of losing them. Adjustable: As organizers have velcro strap, you can easily adjust the height of it. So, you can hang it very close to the handlebars, or let it swing low. A slight variation of the strapping will give you the appropriate height you want. So if you use a stroller board for your stroller you don’t have to face any problem for it. Whether you have got a stroller for Disney or normal regular stroller, you need to know how to attach the organizer to it. Attaching a organizer to a stroller is fairly simple. We have got 3 methods which you can use right away. This goes for strollers with curved handle bars. It’s very easy. Just attach the velcro strap to itself at the side of the curved part. You can hang it higher or lower. If you want it high then attach the velcro strap to the end point. And if you want it hanging freely, just attach the strap a little higher from the end point. This works for strollers with straight handle bars. Just attach the velcro strap to itself straight down the handlebar and that’s it. When attaching with a curved handle bar sometimes, the organizer might be tilted. So, to keep it straight you can attach the velcro strap to itself in an angular direction. This means the strap will have a partial connection to itself. But that’s totally fine because the best strollers come straps strong enough to hold an elephant! 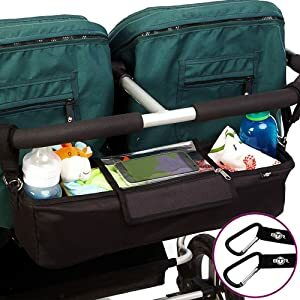 Now you have 10 best stroller organizer 2019 options to choose from. All of these organizers are made of high-quality material and easy to access features that will make your life much easier and your stroller sessions more efficient. So go for your deal and pick the right one you need. Awesome recommendations. I personally love the Universal Baby Jogger Stroller bag. It is not well-designed but looks very trendy as well. Yaa! It is awesome with in simple design.